This book from Meredith Belbin, the UK's leading expert on teams, takes the reader on a different and fascinating journey. 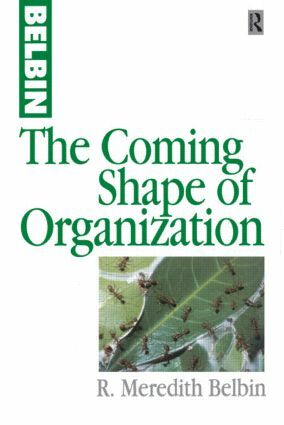 His insightful analysis takes us from the faults of typical hierarchies to the new world of restructured, flatter organizations where new sets of problems are emerging. In the search for alternative systems, Belbin outlines ways in which continuous deployment and career development can result in more effective use of people's talents. He describes the world of the higher social insects where evolution has generated a common set of principles governing organizations at their most advanced. He then suggests that these integrated strengths could be combined effectively with the strategic abilities of humans. A model in the form of the helix, is foreseen in which individuals and teams move forward on the basis of excellence rather than function. Here information technology can assist in the evolution of human organizations to enable them to become both more complex and more viable in the future. Prologue; In search of the future; The faltering organization; The problem with Mr Big; Lessons from a diminutive masterclass; Concurrent versus sequential decision-making; Replacing traditional hierarchy; An alternative way of arranging work; Teams communicate with teams; Employing the highly talented; The culture and the organization; Strategic leadership comes of age; The organization of public affairs; Forces making for change; The evolution of common shape; Epilogue; Exercises; The nine team roles; Further reading; Index.